This article was originally published in Rappler.com on February 8, 2015. MANILA, Philippines – Tears swelled up in Ramil Ramirez’ eyes as he struggled to read the text message flashed on the broken screen of his old Nokia phone. These were just two of the many text messages Ramirez, the village chief of Guindapunan, received from the mayor and the disaster management chief of Daram town before Typhoon Ruby hit Eastern Visayas on December 6, 2014. Ruby (internationally known as Hagupit) was the strongest typhoon that ever hit Daram in recent memory, but the island weathered it because of timely and specific information that enabled local officials to prepare and convince residents to evacuate. 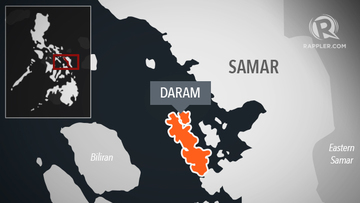 According to Ramirez, those warnings saved the island of Daram, including his village, from the wrath of the typhoon. Guindapunan is a remote village in the outlying part of Daram, a third class town in Western Samar with more than 9,900 households or about 48,000 residents. It faces the Samar Sea that separates Samar island from Leyte. 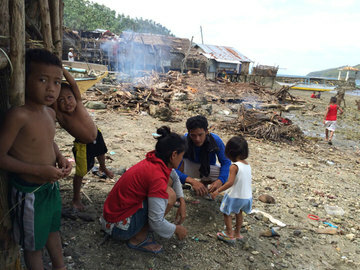 Coastal communities in Samar and neighboring provinces of Leyte and Biliran are among the areas in the country identified as “highly vulnerable to occurrence of high surges,” according to a study conducted by the Department of Science and Technology after Super Typhoon Yolanda (Haiyan). They are frequently hit by typhoons and are located along gently sloping coasts with shallow bays. 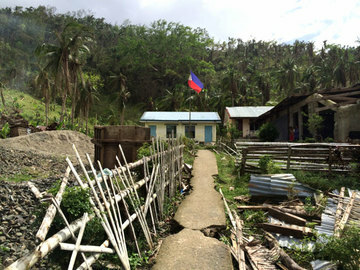 The town of Daram was largely spared by Yolanda, which devastated the region in November 2013. Almost a year after the tragedy, however, it was hit by by typhoon Ruby, the strongest typhoon it ever experienced in recent memory. Ruby packed maximum sustained winds of 175 km/h near the center, and gusts of up to 210 km/h, according to the state weather bureau PAGASA. It generated storm surges of up to 4.5 meters as it made landfall. Daram was identified by Project NOAH, the government’s disaster information center, in its list of areas where the forecast storm surges were expected to be highest – between 2.6 to 3.6 meters. The storm surge warnings were released 36 hours before the typhoon hit land. Storm surge advisories 1 to 4 were issued to give alert on storm surge heights from 2 to 5 meters. A series of timely warnings helped Daram prepare for the typhoon by two days, according to the town’s mayor Lucia Astorga and her disaster management chief Rey Fuentes. Technology and close coordination played a huge part in preparing the town. Of the 58 villages in Daram, about 30 to 35 already have Internet access, Fuentes said. Internet access allowed the town’s disaster management office to monitor updates on rainfall, wind speed, and storm surge alerts from Project Noah and PAGASA. Relaying critical information to areas not reached by Internet connection was a big challenge. The mobile signal is still poor in some areas. Computers and smartphones are also still not widely used, particularly among barangay officials who play a critical role in disaster management. Another challenge was the difficulty in understanding technical terms used by the scientific community. For instance, the latitude and longitude of the typhoon and the units of speed (wind in km/h) and height (storm surge in feet or meters) confused village officials and the public. For this reason, Astorga and Fuentes resorted to translating the information into the local language – Waray – and sending them to the village captains through text (SMS) messages. In Daram, the fastest means of communication is through mobile phones. The municipality has been using this method of communication for disasters since 2011, according to Fuentes, who added that the critical period for public dissemination of information is one to two days before the typhoon gains strength and power goes off. Astorga stressed the importance of using simple and understandable language when spreading critical disaster information. But she noted that it was also easier to convince people to evacuate since the memory of deadly storm surges that hit Samar’s neighboring island of Leyte are still fresh in the public consciousness. Thousands of deaths were attributed to storm surges, an unfamiliar term in Eastern Visayas before Yolanda struck in November 2014. By the time power went out and the Internet got disconnected at about 9:00 pm on December 6, Astorga felt assured she had relayed to all villages the information needed to prevent another tragedy from happening. The sea was still calm and the sky was clear when Guindapunan village captain Ramirez received the barrage of text messages and calls from the town mayor and the disaster chief. The evacuation initiative would take two days – the first phase was preemptive, the second was enforced. It was carried out by Ramirez himself with the help of the village’s tanod (security officers). The announcement was amplified again and again at the purok level, a geographical unit smaller than a village composed of about 150-200 people. The zero casualty record during typhoon Yolanda of San Francisco, a town in Cebu province located in the Camotes islands, is attributed largely to this system of organizing residents at the local level. Ramirez introduced the purok system in Guindapunan after Yolanda, dividing the village into 3 units. The same system is being followed in 38 other villages in Daram. This has bolstered the town’s disaster preparedness efforts during typhoons Glenda, Ruby, and Seniang. The groups serve as support networks at the village level. Volunteers are given various roles that coincide with the phases of a disaster – from preparedness, to response and recovery. They participate in hazard identification, disaster preparedness drives, early warning efforts, damage reporting, relief, and clearing operations, according to Astorga. Twenty more villages are in the process of adopting the purok system, Fuentes said. They will also undergo disaster risk reduction and management (DRRM) training soon. Guindapunan officials activated the purok system to help in disaster information dissemination, evacuation management, and rebuilding efforts. Women packed valuable items, prepared food, secured important documents, and guided their children to the evacuation center. Men patrolled the streets, ensured security, and kept watch for the storm surge. A school building located on higher ground served as the evacuation center for about 125 families or more than 500 people. 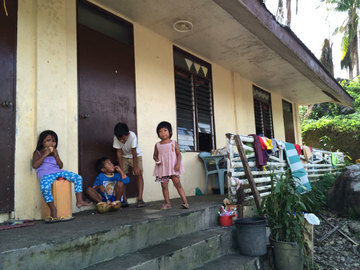 “Baga hin sardinas didto kay duha nga eskwelahan puro puno (We were likes sardines there because the two rooms were full of evacuees),” Ramirez described their situation. “Antos la anay kita hini. Baman kun makalapos ini nga bagyo pwede man kita makabalik ha tagsa-tagsa naton nga mga panimalay,” he told his constituents to console them. (Let’s sacrifice for now. After the typhoon, we can return to our houses). Typhoon Ruby made landfall in Dolores, Eastern Samar, at 9:15 pm Saturday, December 6, 2014. At dawn on December 7, all Ramirez and other evacuees could see were huge waves crashing over the roof of the waiting shed, washing away their shanties and boats. 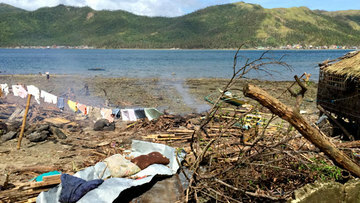 About 81 houses were flattened in Guindapunan, mostly those along the shore. Gudines and his family of 6 lost their home and livelihood. His wife, Linda, said that while they are struggling to pick up the pieces and get back on their feet, she is still thankful they survived the storm. “Makuri nga mawarayan hin balay. Masakit ha huna-huna nga nawarayan hin kalugaringon nga balay. Pero maupay nga waray naibanan an amon pamilya” (It’s difficult to lose your home. It’s painful to lose your own home. But we’re grateful we didn’t lose a member of the family). If it were not for the warnings from the disaster managers and the cooperation of the villagers, nobody in the coastal part of the island would have survived the storm surge that washed away houses and boats as the typhoon battered Eastern Visayas for almost a day. Project Agos is a collaborative platform that combines top-down government action with bottom-up civic engagement to help communities learn about climate change adaptation and disaster risk reduction. Project Agos harnesses technology and social media to ensure critical information flows to those who need it before, during, and after a disaster.